Nose: Leave to aerate, to allow aromas of candied fruits, prunes, vanilla and lychee to come to the fore. Spicy tones of mixed peppercorn and ginger. Fruity and spicy profile. Palate: Silky, fresh with a balanced and dulcet finish. 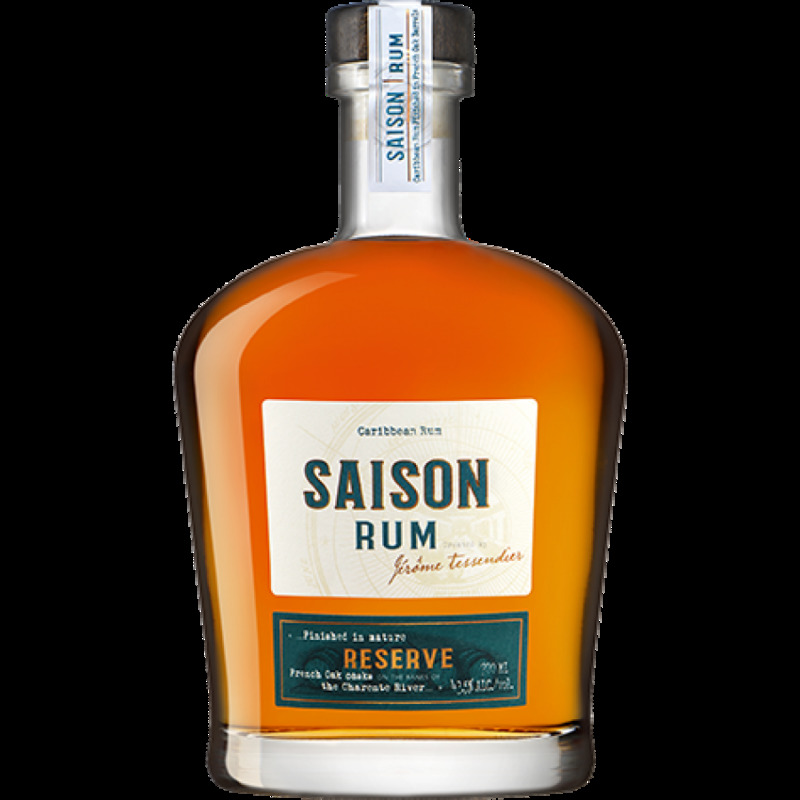 A barrel finished liquor, the Tessendier Saison Reserve Rum finishes its aging process within old Cognac casks. The result is a harmonious, distinctly Cognac taste experience. It delights with candied fruits as well as spice such as mixed peppercorns. A rum to be savored, and a rum to consume at your leisure. First, three distinct distillates are selected from Barbados, Trinidad and Jamaica. The Barbados selection for its fruity and plum notes, Trinidad for its light creaminess, and Jamaica for its vegetal and licorice notes. The Master Blender combines all three with incredible balance, thanks to the richness of the molasses that has been distilled in pot stills. That combined with a light, delicate quality of the sugarcane in column stills. 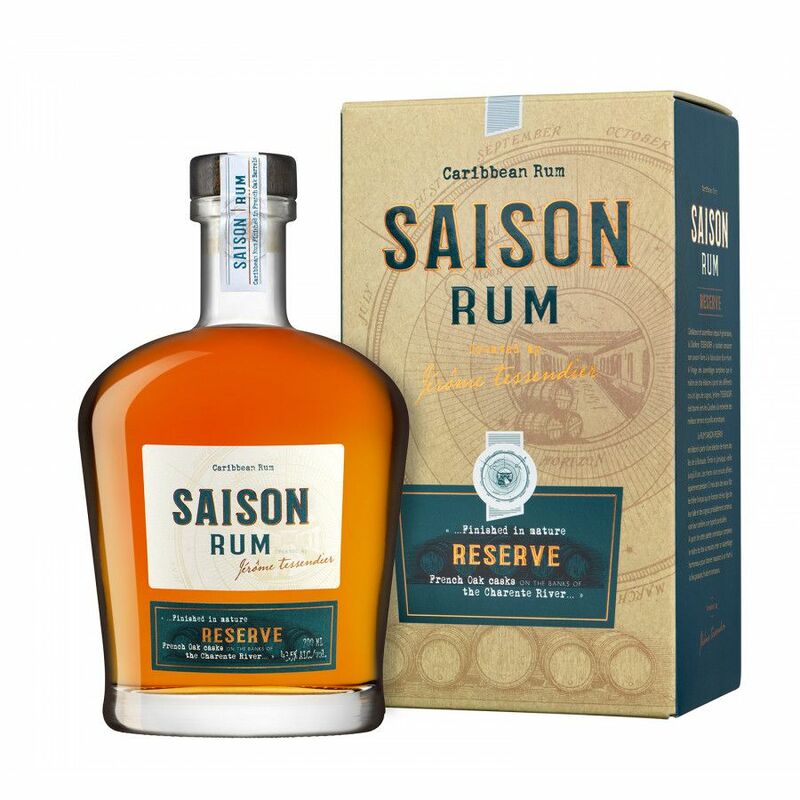 The rums are aged in American white oak casks for up to 8 years in each of their respective original terroirs, to mature in the heat and humidity of the Caribbean. This air quality oxidizes the rum in a particular way to make them age quicker and concentrate the flavors. The rums then travel across the Atlantic to France, where they are finished for 12 months separately in over 50 mature French Limousin oak barrels along the sides of the Charente River. Each barrel will give its own expression to the rum, according to the size, age and Cognacs that were previously inside. Then comes the blending process. The Cellar Master uses his diverse palette of over 50 barrels to dip in and out and create the most exceptional blend. This is possible thanks to the barrel by barrel finishing process. It results in a powerful and fruity rum. No sugar is added and it is gradually reduced to 43.5% ABV. According to expert rum distillers and mixologists, this rum pairs perfectly with an apple tart dessert with caramelized figs and almond. This is a Cognac house that combine both modernity and tradition; drawing upon centuries of savoir-faire to safeguard their innovative spirits and longevity. Their roots date back to the heart of the Cognac region and to the very history of France itself. In 1862, the son Gaston Tessendier acquired the Buisson estate and other parts of land, which soon became the Distillerie Tessendier estate. Gaston was the first to learn the secrets of the vines, with his son following in his footsteps. Over the years they learnt about ageing the Cognacs and distillation, and the third generation of Tessendiers were really the first to master the art of blending Cognac effortlessly. Now in the hands of the fourth generation, Jerome and Lillian, they continue to innovate and drive forth a vision that is unique, driven by emotions with each of their eaux-de-vie, and create a series of multifaceted brands under the overarching label of Distillerie Tessendier such as Cognac Park, Cognac Campagnère, Cognac Grand Breuil and the latest Saison Rum, which sees the Tessendier brothers applying their savoir-faire to the art of rum.